Making good bosses is hard - the idea behind them has got to be varied and fun while still presenting a challenge, and there's a lot of programming for a small section of the game. Ideally, I think they should seem overwhelming at first but then become easy as you watch their movements, learn the openings and start to fight back effectively. For people who allow their progress to be updated to the Crystal Towers 2 site, I keep track of how many times bosses have won agains the player and how many players have defeated them. "Score" is [times won]/[times lost] - I think that 2 is a pretty reasonable score to expect, as it implies that players lost to the boss twice before beating them on the third attempt, a decent balance between presenting a difficult enemy and keeping the game going. It looks like Beam Stack is still the hardest boss, although not by as ludicrous a margin as before - in the first version of the game its score was up at 12 or so. All it took was a little change - making its laser turrets to flash before firing made it much fairer and I think it's one of my favourites. The next hardest one is Xenon Squad, which is fought in a different way from everybody else - its high score might be because players are spending lives working out what they're meant to be doing, though I tried to hint better at this in the new edition. At the other end of the scale, The Cleaner is exactly where it's supposed to be - it's an introductory boss and even though I actually ramped up its difficulty this time around, it's sitting comfortably near 0.5 (you'll probably win against it first time, but if you don't, you'll get it next time). The absolute lowest is Lava Tank, which is easily my least favourite of the bunch - I think it was the first non-platform-style boss I made for the game and it just wasn't challenging enough despite my attempts to make it more acceptable for the new edition. 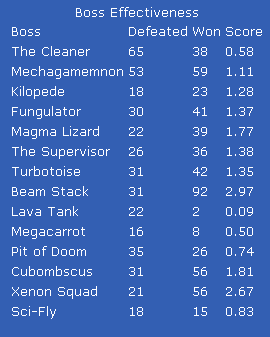 There are a couple of surprises as well - Megacarrot, despite being the last boss of the game, is sitting slightly below The Cleaner in terms of difficulty, although it could be because only the really dedicated and powered-up players get to him. I made an effort to drastically rework Sci-Fly compared to the first edition because it was too easy as well - it's only got to a measly 0.83, but I think this is actually much higher than before. And Cubombscus is at a very respectable 1.81 now despite being one of the easiest before. In the first edition it had a bug that meant that it always remained on its easiest setting no matter how far you got its health bar down, a mistake corrected the second time around! I have finished Crystal Towers 2 (again!) and it is now available on Steam! Thanks to everyone for supporting and spreading this project through the far too many years it's gone on for - and especially to lupineangel for the incredible piece of fanart that is basically the official box art now (if that's legally OK). I'm very pleased to have a game of mine on this service - and maybe, as I burn through the rest of the projects taking up my life, I'll be able to make a new one at some point. Here's the new introduction, with added furniture and birds. Someone just emailed me asking where they could download Treasure Tower, making me realize it had dropped off my site when I did the reorganization - so here's a new download for it! If you use Chrome, you might get a "Not commonly downloaded" warning, because it's stupid - it's OK to click the arrow and "Keep" to verify you want to keep it. Released in 2005 before independent games started to become a big thing, this was probably my most popular game in the fledgling community even though it's looking pretty simple nowadays. Climb the towers against the clock, collecting treasure and food to stay alive. You can also attempt to submit to an online leaderboard, which no longer works. The screenshot is from a Flash version that I put together a few years later. There's a post about its inception here, though the images are long gone. 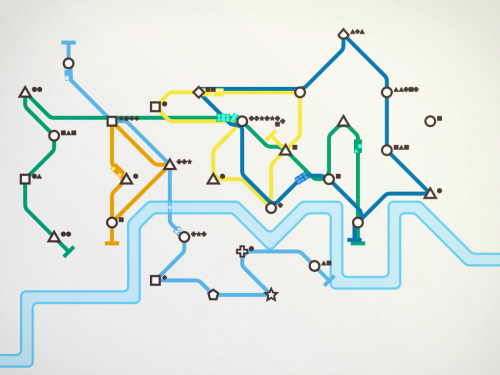 This game is called Mini Metro, and due to my continuing frustration with Boston's aging crippled public transport system it would be logical for me to hate it... but I love it. 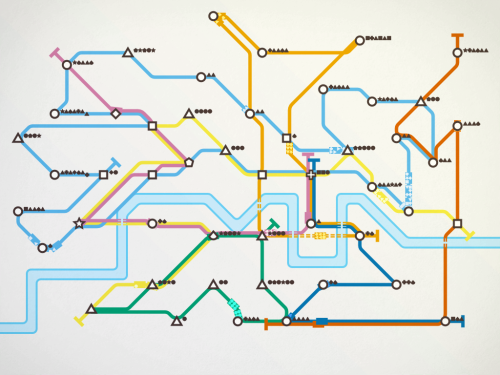 You have to keep ferrying passengers around a slowly increasing network of stations without letting them get overcrowded, making lines and putting trains on to them to provide routes to passengers that need to get from circular stations to square stations to star-shaped stations... it starts off easy but gets complicated very quickly. It thoughtfully includes a colourblind mode, though I don't actually have a problem with the normal one - I think it just selects line colours that are slightly higher in contrast than by default. You can play a version online, and it's in this week's Humble Bundle! I'm pretty sure that there's a game in here somewhere. I haven't quite found out what it is yet. This is a fascinating and extremely worrying article about the current state of microtransactions in mobile games - specifically with the recent remake/ruining of Dungeon Keeper by (who else) EA. I try to see positives in modern games, but things like this paint the industry as a whole as undeniably worse than in the past - this isn't even pay-to-win, this is pay-to-make-at-all-playable. And it affects independent developers as well! Specifically, that the iOS market has been such a race to the bottom on pricing that if you charge more than $0.99 for a game, even a lengthy RPG, people will act like you've just broken into their house and eaten their dog. The iPhone isn't a gaming platform first and foremost, but it's where a significant number of people are playing games, and... it's pretty appalling that this is going to be what anyone thinks they're like. £69.99! That's a macrotransaction, if anything. Here's a quick note about the only IDE I can actually get excited about - it's hard to believe it's been seven years since release day. I know everyone's probably sick of Humble Bundles by now, but I have a bit of a special interest in this one! 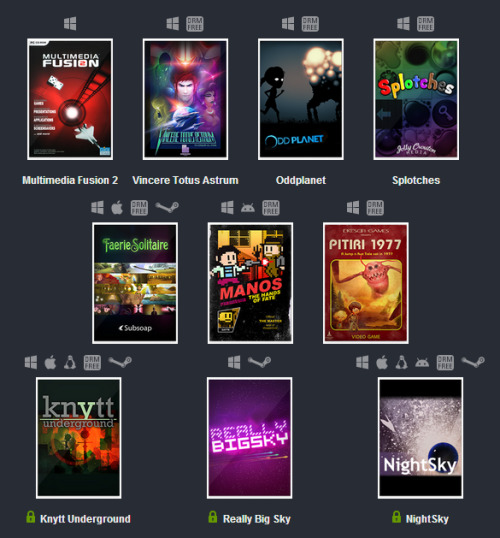 Multimedia Fusion 2 was used to make Crystal Towers 2 and some good games as well, and for the next couple of days you can get it for as low as $1 (if you’re a real cheapskate). And six to nine games that were made with it, and a heap of soundtracks as well. If anyone’s interested in game-making, it's a fantastic introduction and I can't recommend it enough. (And it also gives you a voucher to upgrade up to the new Fusion 2.5 for less, if you decide to later). I was lucky enough to catch some of the stream from the Clickteam convention today, after forgetting about it during my holiday - and there's some exciting stuff planned that I had no idea about! As anticipated a while ago, MMF is going to drop the "Multimedia" from its name because everyone has stopped using it now, and it will become Fusion 3. But unexpectedly, before that, it's going to become Fusion 2.5, which will be an overhaul that includes things like Box2D physics on every object (replacing the default movements, which have been - to be fair to them - awful for a long time) and a host of other exciting changes. Another problem that's been at the back of people's minds for MMF thus far is that the runtime system is much slower than you would think because the system to check and react to events involves Russian dolls of virtual machines in virtual machines, especially when you're running in Java. To solve this, they're on their way to translating events directly into code through a module called Fusion Event Compiler, FEC. This means the application will now be able to be exported to the target language's source (if you see what I mean) - making it much, much faster than before, and also with the advantage of being able to modify things manually if necessary. Events will be compiled to use CTLib, a game programming library for C++, in which you can reportedly also quite plausibly make applications from the ground up. These are interesting times indeed! So I think it's high time I actually posted some activity in terms of what I promised I would do last year - namely, get some stuff working with the XBox runtime. Here's Running Free. The main issue with converting the game between platforms is the presentation and control, especially as the game originated with very unconventional controls being almost entirely done through the rotation of the iPhone. I'm fortunate to have already done a Flash version that was sort of in-between, but even then, you're going from a game in which you could use the mouse to one in which you have pure controller support. This new title screen shows one of the simplest to correct problems. The level select screen needed more of an overhaul because its aspect ratio was completely different from what you'd find on a television screen. Here, I've shifted the level titles over to the left, and used the extra space to provide a minimap and give myself a bit more room to display the player's overall progress. There are a lot of things to think about... but I really am impressed with how the whole thing really can be exported to Visual Studio and run seamlessly at this point. With the Super Metroid series finally and regrettably over, here are some videos by other people of one of my games! rakarr found one of them this morning and sent it on to me, and having not vanity-searched it in a long time, I was really surprised to see any presence of it on Youtube. The first is by someone who vaguely knows of my existence through the GameFAQs classic games board, but he was recommended it by someone with no connection to me - this is Revelengance's twenty-minute playthrough. My favourite moment is his voice acting of the introduction! The second is the one that was found by rakarr, and is notable for being one hour long, on a moderately popular channel, and for the player's amazing Northern accent. I released Crystal Towers 2 about four years too late to be impressive... but just at the right time for people to spread it around! I nearly called this entry "Technical coonsiderations" before realizing that that would put my life just too far over the edge. The last three evenings spent on Hatogate were a great opportunity to start up MMF again and do a quick project, after not touching it for the last while (hopefully it'll lead into me completing the Xbox versions of Special Agent and Running Free). And it was an interesting exercise in doing something I haven't done with it before - I've experimented in writing adventure games, but this one felt like it really needed a scripting language running behind the game to make it easy to program reactions to commands. So naturally, I modelled it after the only language remotely mad enough to contain anything Hatoful-related. I wrote it in ZZT-OOP. That is, I based the syntax heavily on the scripting language that ZZT uses, as it gave me something to aim towards (writing a language from scratch at the same time as writing something in that language is like trying to handwrite two different sentences with each hand simultaneously) - and being familiar with it made it readable to me at the same time as being easily parseable, based on commands denoted by # and then another couple of tokens per line. The language is heavily based on a GOTO philosophy with programs jumping about between labels all over the place, but for small scripts it does its job very well - and this game is greatly simplified by the way that there's only one location you can be doing anything in, and one object that you can interact with on the screen ever, so it would never get too tangled. So I borrowed most of the vocabulary - when the player builds a command with a verb and object (or two objects for USE), the game looks in the script for a label matching that command, then starts there and runs through the program. If it doesn't find one, it tries again with the object name replaced with ANYTHING, as a fall-through backup for places where you just need the same response for a variety of things (like using anything on the paintbrush). Labels are labelled with :, comments with ', commands with # (and # followed by an unrecognized command is assumed to be a jump to the label of the same name) and everything else is assumed to be text to display onscreen. Like most good ZZT scripts, things tend to start with #END, which in this case stops running a script and hands control back to the player. #GIVE and #TAKE form a pair of commands to add or remove an item from your inventory - #TAKE has an unfortunately counter-intuitive name because it sounds like you're taking and therefore gaining an item, but I chose to live with this rather than think up a synonym. Similarly, #SET and #CLEAR are used to turn flags on and off - these are named on/off switches that just act like inventory items that you can't see or interact with. Unlike in ZZT, of course, there is no hidden flag limit, flag name length limit, or risk of detonating the flag pile by innocently setting a flag twice. Syntax for #IF was a little more involved, mostly due to my own choice - I could have lived with just one variant, but to make scripting slightly easier, I came up with four different varieties of it. #IF followed by two tokens will check the flag list for token 1 and go to the label matching token 2 if it's found. #IF with only one token after it will check the flag list as above, but will then run the next line if it's found, and skip over it if not. This is useful for situations where you just want to display one alternative line of text depending on whether the player's done something before (I could have implemented #ZAP... but consciously chose not to). For situations where you want to check a flag isn't on, I threw in an #IFNOT command rather than force myself to think backwards. Supporting just one command or line on an #IF is still rather limiting, but it works here - and led to things like #IFNOT PUDDINGTHROWN SKIPLIZARDPUDDING, which is among the most surreal lines of code I've ever written. Of course, I also had to make up a couple of commands specific to this type of game - #SHOW changes the screen shown, and #SPRITE followed by a name and show/hide toggles the sprites overlaid on the location on and off. #ACHIEVE turns on an achievement and #ENDING stops the game. The classic #DIE is present, but only as a label that shows the death screen and calls #ENDGAME, which displays the death text and sets the game up to restart on the next click. It turns out that it's quite easy to create a bad language by just making it up as you go along, and I found myself putting things in to work around my own parser quite often - :END was set up as a label as well as a command for convenience at first, because the original three-token #IF lines could only go to labels and not call commands directly - and even now, you can't jump directly to a label with multiple words and have to duplicate them (:PECKMILLET). There are also a couple of special cases handled by the game and not in the code - the counter for turns before Okosan appears and the death achievement are two of them - but overall it turned into quite a neat little experiment, and I'd be interested to try making another adventure up in the same language to see if it holds together. In doing the interface, I also noticed something very interesting about Shadowgate - the screen is arranged so that all the buttons are on an 8x8 pixel grid. Presumably for ease of laying them out? xaq's human-parser mini-adventure game captured all of our attentions this week to the tune of 144 comments, and in return for him giving us that experience, I voiced the notion of turning it into an actual Flash game. So after the Livejournal version was over, he sent me a wonderfully programmatic layout of the possible commands and conditions for each one - and it's only through reading the whole thing that I realize just how hilarious it is, really doing justice to the weird tone that Hatoful is written in while putting it in a Shadowgate-like setup. Well done! This is something of a test release, as I'm the only one who's played with it so far - eventually I'd like to put a title screen and maybe some music on to it, then hopefully see what Moa thinks! It is possible that I've translated the entire thing without any bugs - stranger things have happened, but only about six ever, and they were all in Hatoful Boyfriend. So if you do encounter anything odd happening (that is, anything identifiably odder than normal) let me know. The most likely thing is text running off the bottom of the screen, as I haven't checked all the branches yet. This was an interesting quick thing to work on, and I'll write up a technical post about it soon - thank you, xaq, for providing it! 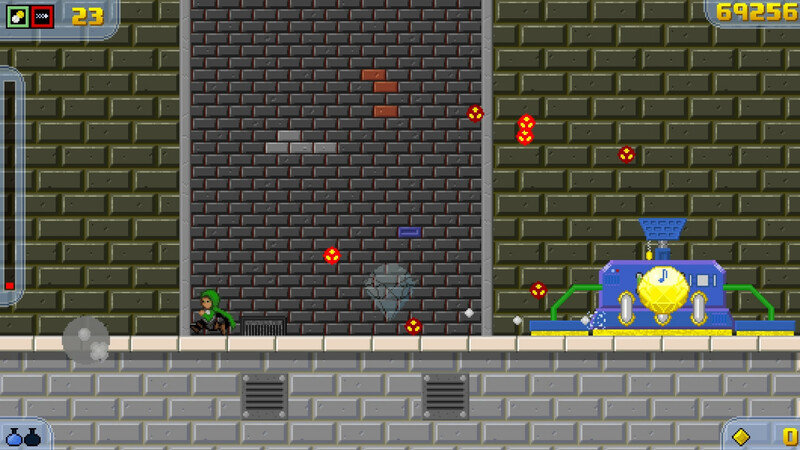 Running Free is my latest candidate to put through Clickteam's XNA runtime! I've settled on this as a first target to complete due to its small size - the entire game is basically made up of just a level selector and gameplay frame that handles everything, so changes only have to be made to a very small area. I was once again impressed by how quickly I could just change the application's build type to XNA for Windows and hit the Export button, going through the level select menu and everything without any problems whatsoever... though the physics of the game were completely broken when I first started it up. After some investigation, I found that this was due to an isolated but fairly severe mathematical error in the expression-evaluating code where the Min() and Max() functions wouldn't return the right values under certain circumstances. (Max(-30, -1.0), for example, is 0 - where were the beta testers!) But having fixed that myself for the time being, and then having fixed a further error caused by me getting the implementation for Min() wrong in a different way when I patched over it, the game ran exactly as it did in the EXE version, and was ready for reworking for the Xbox. One of the most dramatic changes that had to be made was in orientation - Running Free was originally laid out to be viewed on the iPhone vertically, while widescreen televisions are decidedly horizontal. 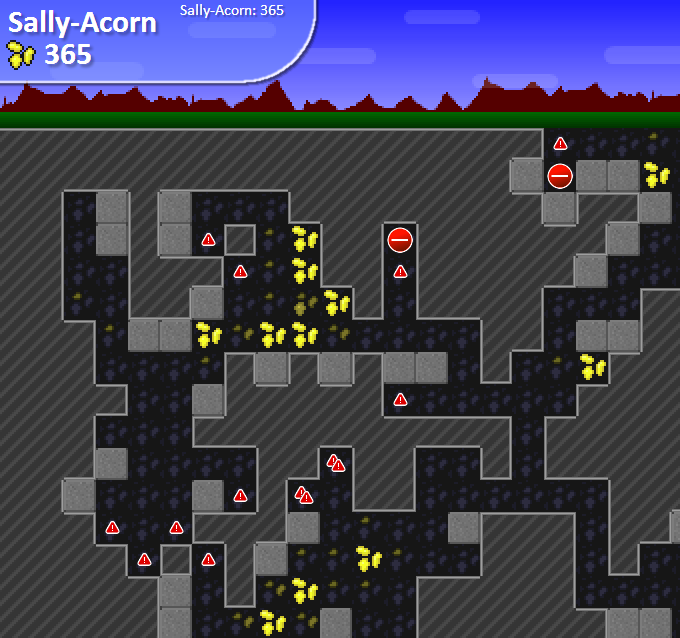 Because programmers are lazy by nature and tend to choose the path that involves the least work now and in the future, I wanted to go with an approach that would let me keep the original level layout file, and just change how I was interpreting it so that the levels were drawn in a different way. Level=? 322221 6 * 4 6 4 6 4 6 4 322222X 4 6 E! 4 6 4 6* *4 6 4 6 4 6 @ 4 988888888887 ? ...along with a couple of other fields that store the level name, par flips/time, and so on. 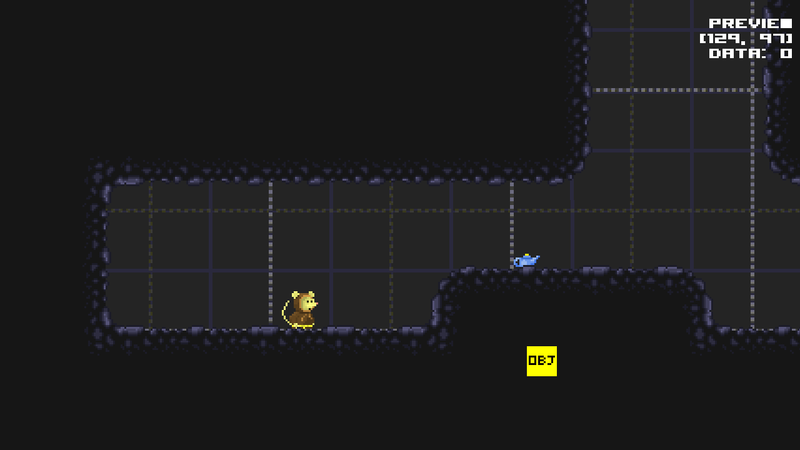 The game then chews through each character in order and places the corresponding tile at the next horizontal position, starting a new row when it reaches the designated LEVEL_WIDTH. And a quick check in Excel gives us the formula MOD(X;5)*3+(FLOOR(X/5;1)) to do this on the 3x5 set of tiles that I mocked up there. Translating this in to MMF is easy enough - you set the "next tile" to point to that instead of just increasing it by 1 each time. Which produces this. And this frilly specimen isn't as far off the mark as it might first appear - those little border tiles are represented by numbers in the level string, the number indicating which side of the square to place the border (laid out like a backwards numeric keypad - 3 draws a square on the bottom right, 7 on the top left, 6 with two squares on the right hand side...) To complete the new layout, those sides also needed to be translated. As you can see, this technique doesn't technically rotate the level - it actually mirrors it diagonally. Therefore, I also had to adjust what "initial gravity direction" meant, as well as reversing the flag for telling the game that the player should start running clockwise. (This is fortunate because the first time I wrote the engine, I somehow got the names for "clockwise" and "anticlockwise" consistently wrong all the way through, so you could say that they're now finally correct). And now the re-orientated game runs fine. Work on the interface will come next - it's strange to make the game feel more awkward after the immediacy of touch control, but now everything has to be done without the benefit of a mouse! Apparently not feeling like he had unleashed enough suffering on the world, Qrostar - the creator of Hanano Puzzle - has released another puzzle game. This one is called Jelly Puzzle, or something like it, and will be instantly familiar to anyone who played the previous one - it features more coloured blocks and infuriating PxTone music in prime-numbered time signatures, this time with a higher-resolution Worms 2-ish aesthetic. Have fun with this one, because this time around, non-Japanese speakers don't even get the benefit of instructions! Left-click to move a block left, right-click to move it right. Blocks of the same colour (blue, not-blue and other) placed adjacent to each other merge together. That's all I've been able to work out so far. The solution to level 1 is not among these things. I'm not 100% sure as to the goal of the game yet (though it's probably to eliminate all the 1-block pieces), but after the last one, I think the only thing this author would ask you to do with jelly is attempt to nail it to the ceiling. Get it here or here - and say goodbye to your brain. An old project might be coming back again (and doesn't it feel strange describing it like that) - I've submitted Crystal Towers 2 to Greenlight on Steam! If you've got an account, I'd really appreciate a vote up and a few words, followed by optionally spamming it to all your friends everywhere. The more votes I get on this thing, the better a chance I have of it eventually seeing a release there. I would also welcome any copy-editing of the description I currently have there, because I am terrible at advertising my own games, possessing as I do the natural enthusiasm of a bag of pencil-shavings. Even besides that, plans are also in place to have it featured as part of an independent bundle - so it may get a revitalization either way. Inspiration is such a strange beast. It's great to have it back in some form after being away from MMF for a while, but I feel I'm going to have to announce once again that all the projects that I've been promising to finish for ages are now on hold because I'm busy making a completely new game once more. The new prototype has been granted its own folder now - surely the mark of some confidence. I really love the idea, and I'm really happy with how the look is coming out - apparently I have suddenly learned how to draw things to an acceptable standard - but this game is still a bit of a mystery in that I'm still not sure where to go with it or what strategy really exists. You can roll around, learn how to align yourself and eat the flowers - is that what the game's going to be? Are puzzles with multiple sheep necessary or desirable? What other elements do there need to be - platforms you can only use once, gates that only work in one direction? Which ones of these make the game interesting and not overly restrictive? Here - roll a sheep around! Sheep Roll - from an original modernist poetic composition by ravenworks. Tumble the fat sheep around and eat the flowers by planting him face down on them. As usual, I'm not really sure what the greater point of this game is yet, but perhaps one will come to me. I can say that I thought that sketching this out would be easy - but once I'd got going, the finer points of sheep-rolling mathematics proved to be a major obstacle! I first had to work out how many different frames of animation I needed, and then spent the evening writing up all the permutations of angles, frames and directions that were needed to allow full movement (I was hoping that a pattern would emerge, but none did). Use the mouse. Saving is automatic. Continuing the Japanese tradition of humble understatement last seen in Hatoful Boyfriend, this is an independent game called Hanano Puzzle ('Hanano' from the Japanese meaning "how the bastards am I meant to do this one".) I heard of it through the GameFAQs classic games board, where several members have been working their way through its challenges and demented PxTone music. The idea of the game sounds simple - your only available move is to swap blocks horizontally, blocks will grow a flower in the direction of their arrow when they're next to another flower of the same colour, and your objective is to sprout all the blocks on the screen. In practice, the puzzles are so intricately put together and/or consistently sadistic that each one is a maddening challenge - rather appropriately, it really is about as hard as getting flowers to sprout out of bricks. The game seems to intentionally go directly against the traditional puzzle progression of introducing a technique to you and then encouraging you to use it - instead, what this does is force you to discover a new technique in order to complete the level in front of you, right from the very start. Level 1 is something that I'd expect to find towards the end of a stretch of levels in most other games - instead of giving you a small demonstrative level to play around in, it drops you right into working out how to use the blocks in secondary ways and the physical effects of growing flowers out of them. But after a couple of these puzzles, it lets you believe you're getting somewhere and you make some fast progress until you run into the next flowery brick wall. I've had a week or so of on-and-off struggling, and I'm now on level 15. There are fifty of them. This is going to be a long game.